This is the family-owned brand&apos;s 58th location. Texas de Brazil adds a second California location tonight when it opens in The Marketplace at Fresno&apos;s River Park Shopping Center, 7634 N. Blackstone Avenue. 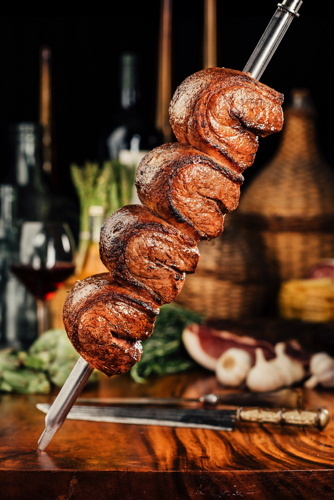 This is the family-owned brand&apos;s 58th location where guests enjoy authentic churrasco and rodizio-style service complemented by Texas de Brazil&apos;s generous hospitality. The 7600 square-foot restaurant features a vibrantly-decorated dining room with seating for 200, an open grill kitchen, expansive salad area, intimate lounge, award-winning wine cellar, and outdoor patio seating. "We are happy to introduce dining patrons in Fresno to our unique dining experience and the traditional Brazilian cuisine that entices guests back time and again," says Salim Asrawi, Chief Operating Officer of Texas de Brazil. "This is our first grand opening after officially marking our brand&apos;s 20th anniversary and we hope this second California location receives the enthusiastic welcome our Irvine restaurant experienced," he adds. For the main course, servers expertly prepare mouthwatering cuts of meat grilled to perfection over natural wood charcoal – a gaucho tradition passed down through generations. When guests flip a two-sided disc located at each seat from red to green, the gauchos carve slow-roasted meats tableside, including Brazilian picanha (sirloin), lamb chops, filet mignon, leg of lamb, Parmesan-crusted pork loin, bacon wrapped chicken breast and more. When a break is needed in the unending flow of mouthwatering meats, guests simply turn their disc back to red. This unique style of dining helps guests fit Texas de Brazil into any timeframe – from leisurely meals with friends and family or efficient visits with business associates. A private dining venue for up to 25 guests offers a special place for small gatherings, and the remarkable wine collection complements any occasion with varietals from acclaimed California and South America vineyards to Texas de Brazil&apos;s exclusive private label selection bottled in Chile. The lounge offers craft cocktails including the traditional Brazilian Caipirinha in a variety of flavors and a full selection of specialty cocktails, beer and soft drinks including the Brazilian Guarana. Lunch service will soon be added. Now, dinner service is available Mon.-Thurs. 5-9:30 p.m.; Fri. 5-10 p.m.; Sat. 4-10 p.m. and Sun. 4-9 p.m., the restaurant also features Happy Hour each Monday through Friday from 4:30-6 p.m. Dinner pricing is $44.99 full menu; $24.99 salad area only. When purchased with a full-price adult meal, youths 6-12 years old dine at a 50% discount; 3-5 year-olds dine for $5; and those under two dine complimentary.